Our Team Sales division specializes in providing teams and organizations with an unparalleled buying experience. Our mission is not only to provide quality goods to our customers, but to also provide unmatched level of quality customer service. 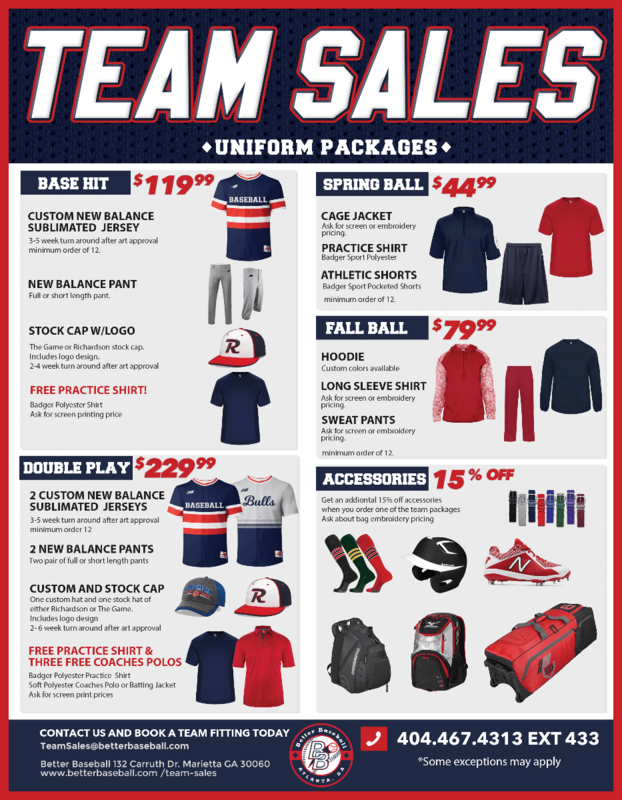 Choose from some of the hottest brands in diamond sports including Wilson, Rawlings, Louisville Slugger, New Balance, Demarini, Under Armour, Marucci, Evo Shield, Majestic, Twin City Knitting, The Game, Badger, and Richardson. With a broad array of companies to choose from, we are certain we can deliver you the best quality uniforms and equipment for your teams budget. We also provide special package pricing for those who are looking to completely outfit their team or organization. So if you are ready for a Team Sales experience like none other contact us at 1-800-997-4233 option 6 with any questions or email us at [email protected] and we will get back with you ASAP. "Any budget big or small, come to Better Baseball, we do it all!"